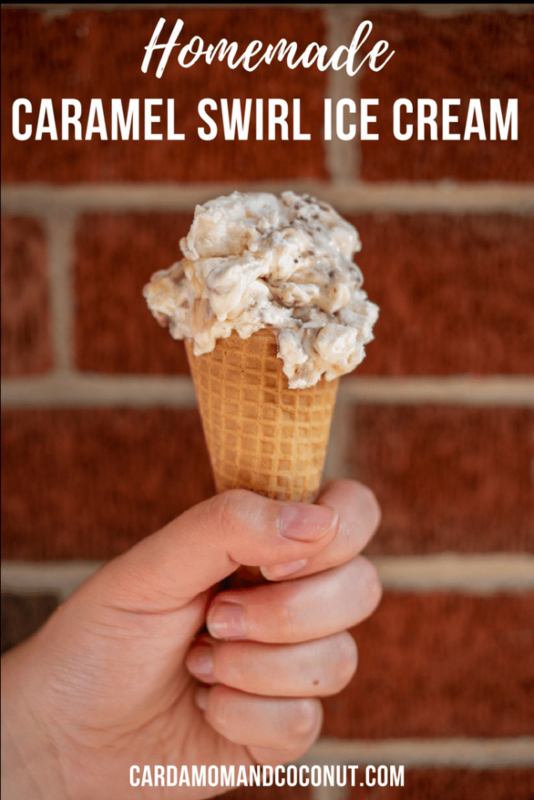 Easy, homemade, no-churn caramel swirl ice cream – no ice cream maker required! [social_warfare] It was a hot summer day in Seattle. 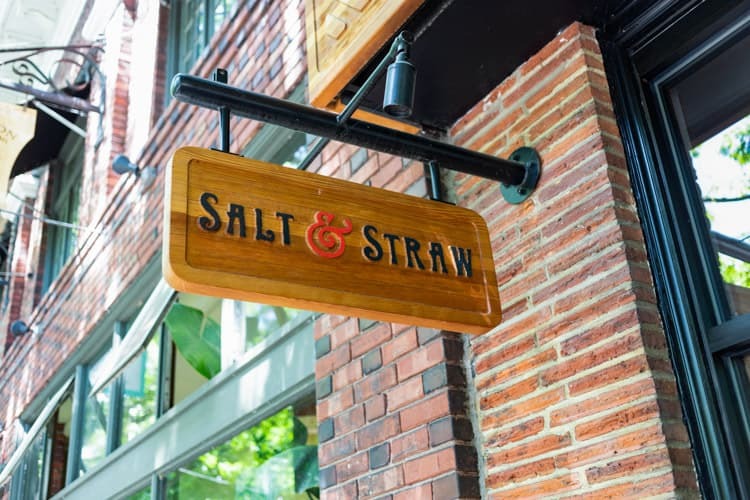 After walking from the Ballard Locks to the Nordic Museum we were in the Ballard neighborhood when we stumbled across Salt & Straw, a local ice cream shop serving “handmade, deliciously interesting ice cream”. 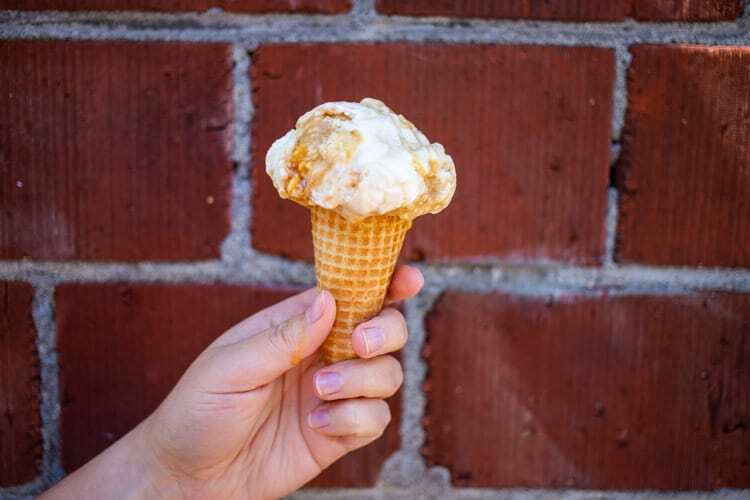 A scoop of sea salt with caramel ribbon ice cream in a sugar cone was the perfect afternoon pick me up. 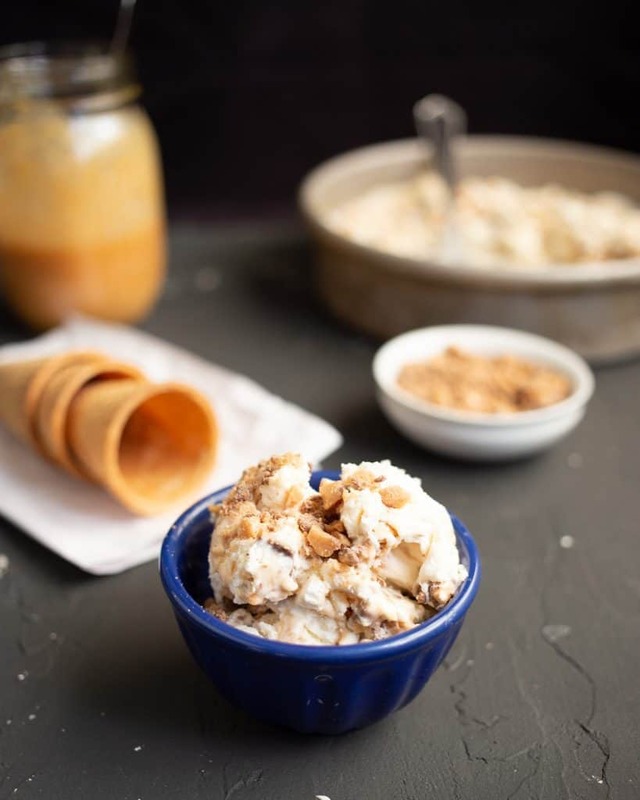 This caramel swirl ice cream recipe features a creamy, sea salt ice cream base with caramel ribbons from homemade salted caramel sauce and brings back the flavors and memories of my trip to Seattle. It’s the perfect recipe for a hot summer day. 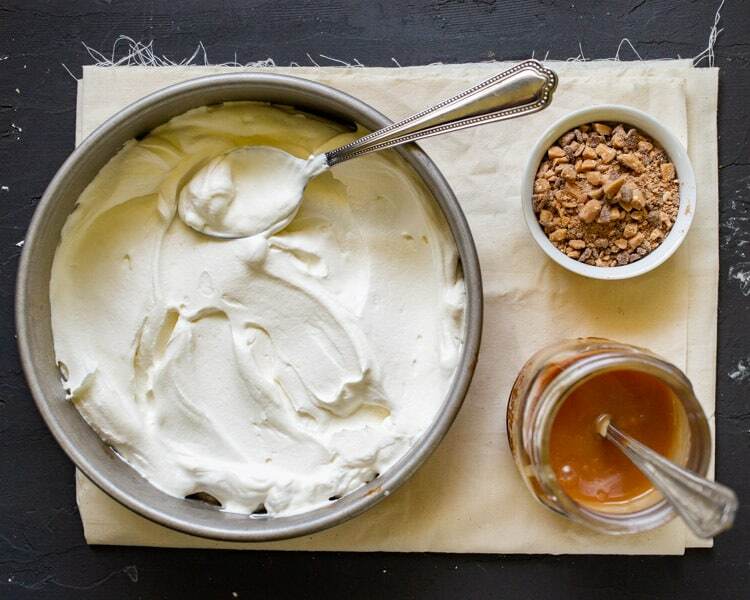 No-churn ice cream is so simple – the hardest part is being patient enough to let it set before digging in. You’ll need caramel sauce to make this recipe. You can either make your own (try this Homemade Caramel Sauce recipe) or pick up a jar of caramel sauce from the grocery store. If you have regular caramel sauce, mix in a teaspoon of sea salt to make salted caramel. Start by whipping the cream. You’ll know the cream is ready when the peaks hold firm. Then drizzle in the sweetened condensed milk, vanilla extract, and salt and continue to whip. When the sweetened condensed milk is fully mixed in, spoon half of the mixture into a metal pan. You can use pretty much any freezer-safe dish for this recipe, metal pans and a larger surface area will freeze more quickly. Drizzle half of the caramel sauce on top. 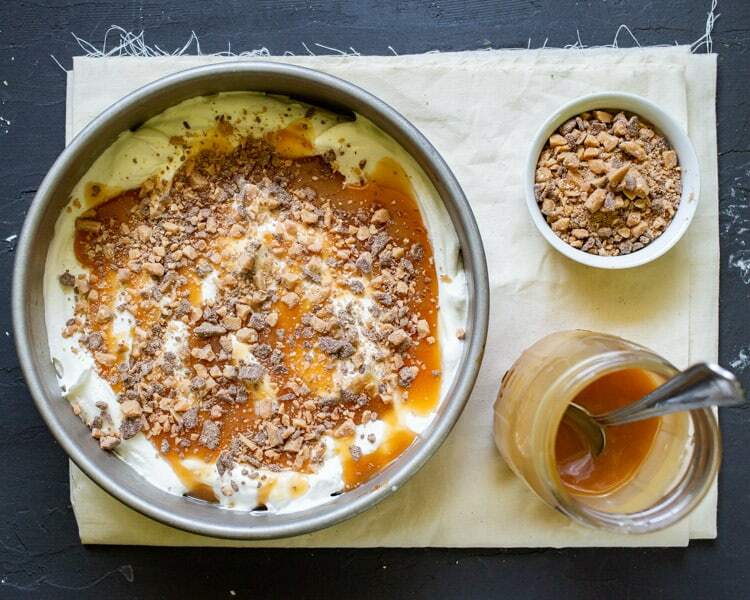 If you want a bit of crunch, add some toffee bits on top of the caramel. Repeat with the rest of the mixture. Then swirl the caramel and ice cream mixture together using a chopstick or knife. Freeze for about four hours before serving. 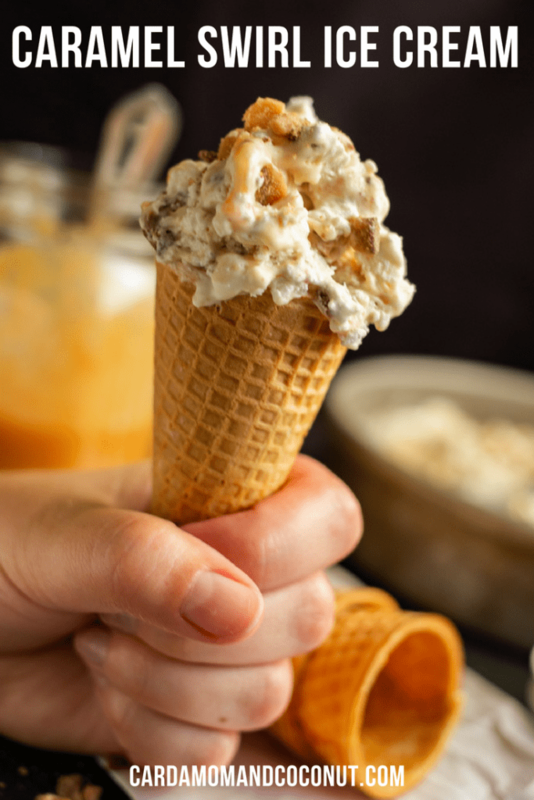 This ice cream is fantastic in a cone, served with warm apple pie, or in an ice cream sundae. High-quality sea salt makes this ice cream shine. My favorite finishing salt is this Jacobsen sea salt, most grocery stores will stock sea salt flakes as well. 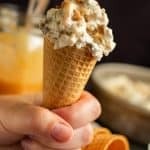 You can make this ice cream with any stand mixer or hand mixer will work. If you’re good with a whisk, you could even make this without a mixer. I’ve had a Kitchen Aid mixer for years and it makes this ice cream in a snap. A proper ice cream scoop will help you get nice round scoops. 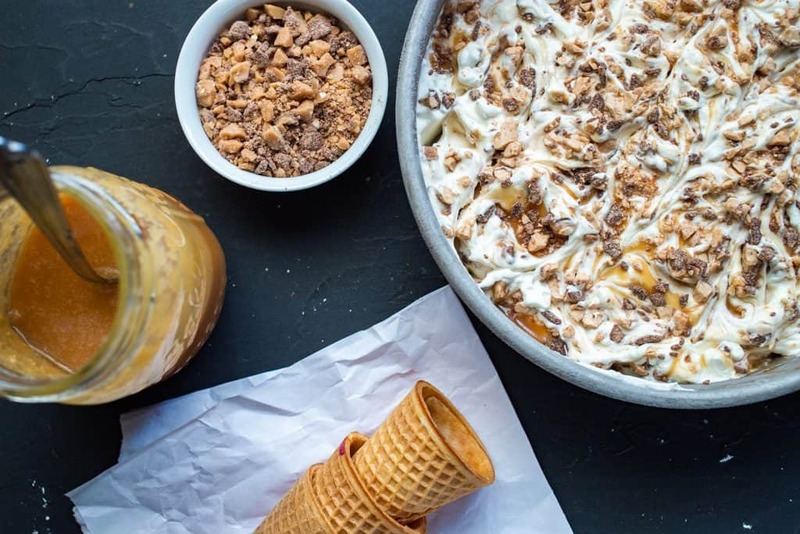 Looking for more no-churn ice cream recipes? Try this Double Chocolate No-Churn Ice Cream. 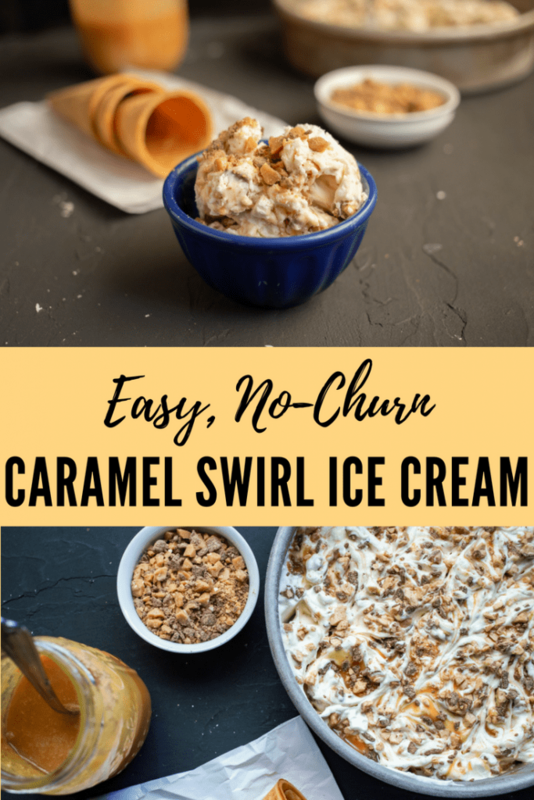 If you try this recipe for easy caramel swirl no-churn ice cream, leave a comment and review below and let me know how you liked it. 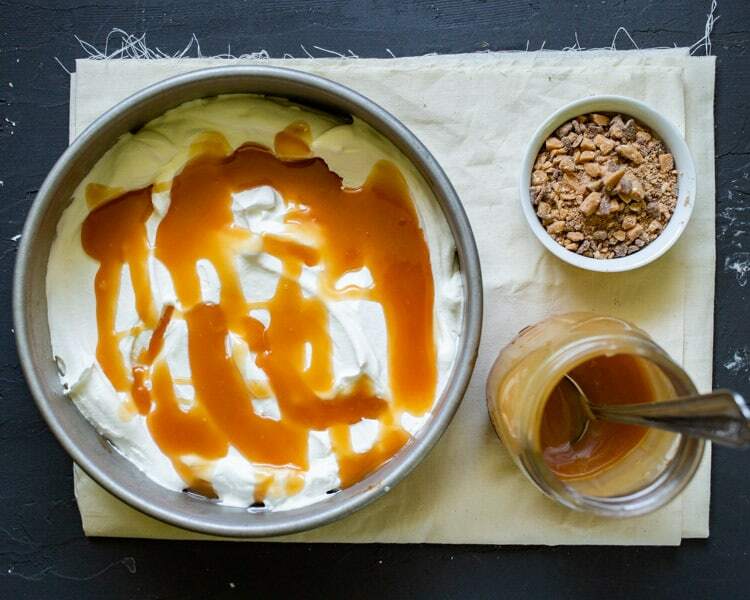 Easy, homemade, no-churn caramel swirl ice cream - no ice cream maker required! Drizzle in the sweetened condensed milk, vanilla extract, and sea salt while continuing to whip. When the sweetened condensed milk is fully incorporated, move half of the ice cream base mixture to a round metal cake pan or loaf pan. Drizzle half of the caramel sauce over the ice cream base. Sprinkle with half of the toffee bits if using. Add the remaining ice cream mixture. Drizzle the remaining caramel on top. Add the remaining toffee bits. 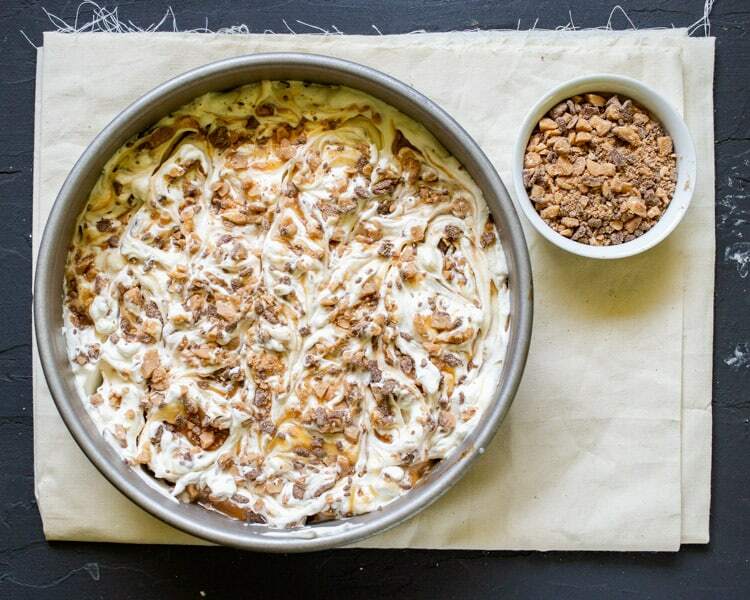 Using a chopstick or other thin utensil to swirl the caramel and ice cream base together. A larger metal pan will freeze more quickly, but any freezer-safe container will work. I love caramel ice cream! Looks so delicious and I love how easy it is to make! Caramel is one of my most favourite things so this sounds absolutely incredible! Definitely going to be making this! I have a serious problem with your photos. There just is NOT enough of that dang ice cream on the cone! Seriously. This ice cream looks so dang delicious that I would be fighting for more real estate on that ice cream cone, even if it means there is going to be a balancing act that needs to happen. Hmmmm…. caramel swirl icecream is one of my favorite icecream flavors and I love that you added toffee bits. Nothing beats a ice cream with a crunchy goodness in there. Now this is No churn too. This ice cream has everything going for it. I am making this ASAP. I can’t get enough ice cream right now. That caramel swirl looks so delicious. I need to make this recipe now! Perfect for Labor Day weekend. It has become too hot all of a sudden again! This is the perfect treat to beat that heat. I love that it is a no cook!! This looks so easy to make! I remember making ice cream as a kid and it took forever! I have a slight obsession with Caramel! I love it on or in Ice Cream. Thank you for Sharing this. I LOVE homemade ice cream and caramel!!! I is a win on so many levels for me!! Saving to try! Love a good ice cream recipe!!! So good!! !